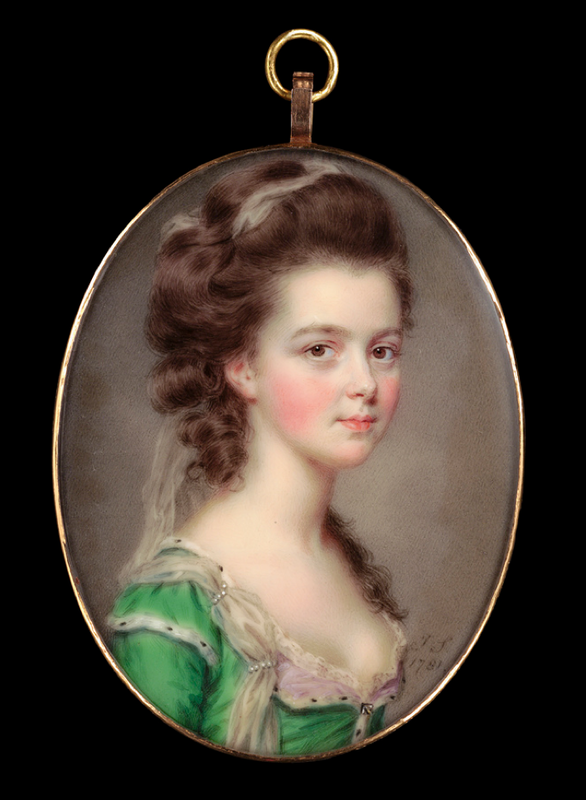 I've long been a fan of Mary Russell's 1781 portrait, and the striking green dress she wears. I've long wanted to make it, but haven't been sure exactly what it is. It does not seem to have the "zone front" as you can see it extends down the front. The appears to be opened slightly at the top, and the top front folds down, revealing the lilac colored lining. Underneath?? It has a lace edge, but you can't see much else. It has short sleeves over longer, though it's unclear if they extend to just the elbow or the wrist. Robe à la Levantine garnie en hermine, coëffure à la Créole: le juppon et la soubreveste nommées l'Assyrienne; inventé par P.N. Sarrazin Costumier ordinaire de Nosseigneurs les Princes du Sang freres du Roi, et Directeur ordinaire du Sallon des Costumes du Colisée. 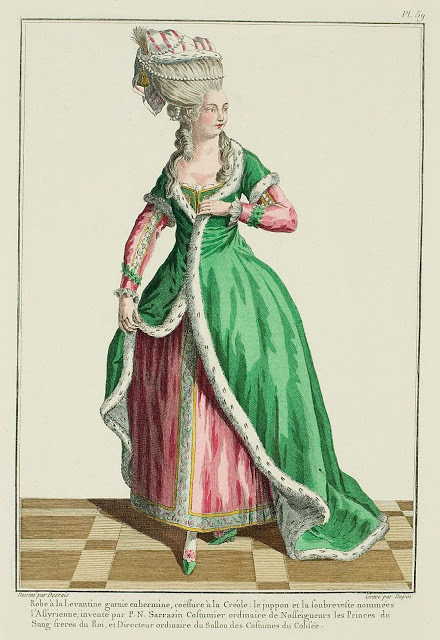 Robe à la Levantine trimmed in ermine, coiffure à la Créole: the petticoat and underbodice are called l'Assyrienne; invented by P.N. 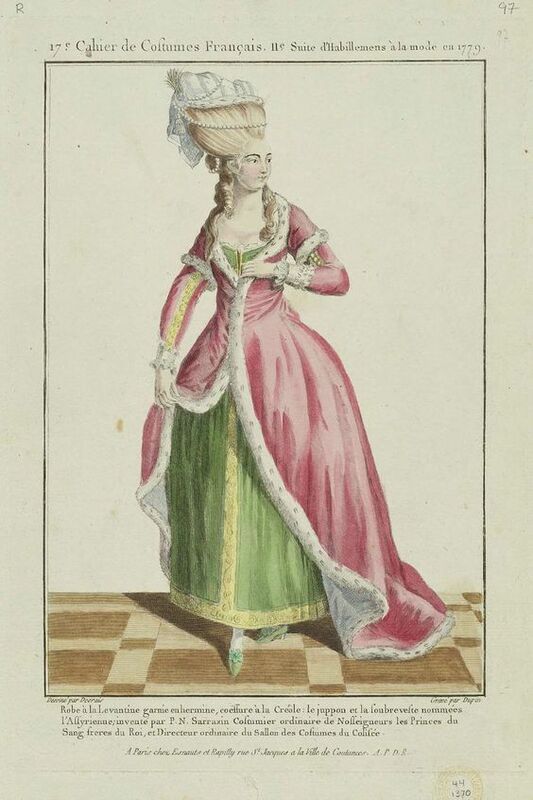 Sarrazin, costumer in ordinary to their Highnesses the Princes of the Blood, brothers of the King, and director in ordinary of the Salon of the Costumes of the Coliseum. 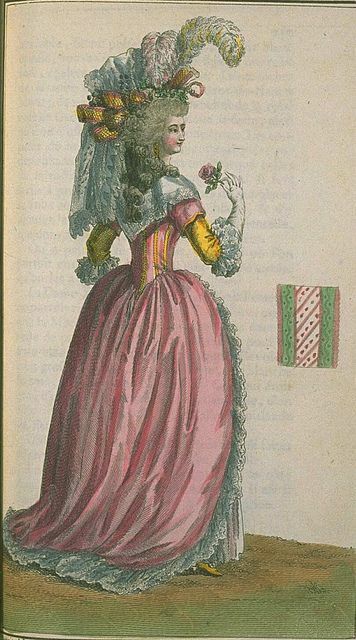 The blogger adds, "This specific plate depicts a costume for the theater or a ball, but there is an ordinary version - see my translation of the longer text belonging to this plate here. The levantine is a short-sleeved gown worn over a long-sleeved undervest.]" THE LEVANTINE is of the number of the new Dresses. It is so comfortable and requires so few preparations, either to put it on or take it off, that it has merited the nickname, Negligée of Voluptuousness. It is a Gown with mancherons, fitted en fourreau in back: that is to say, the skirt is only pleated on the back and the sides. ** It fastens at will over the chest, and must seem instead posed on the stays/body, which are attached. This Gown covers in part an undervest opening in front and coupée at the waist. Amadis sleeves come through the Levantine's mancherons, and are finished with a parement placed en barriere. Petticoat matching the undervest, opening in the front as well, and trimmed with an embroidered border. 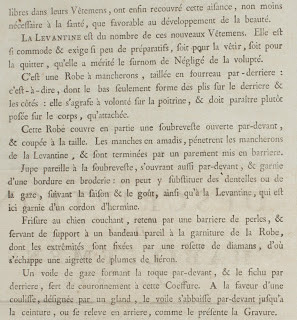 Lace or gauze can be substituted for it, following the season and taste, together with the Levantine, which is here trimmed with a cordon of ermine. Hair in chien couchant, held in by a barriere of pearls, and serving as a support for a bandeau matching the trim of the Gown. The extremities of the bandeau are fixed with a diamond rosette, from which escapes an aigrette of heron feathers. A gauze veil forming the toque in front, and the kerchief in back, serve as the cap of this Coiffure. With the help of a drawstring, ending with a tassel, the veil is lowered in front to the belt, or raised in back, as presented in the Print. There is also an alternate coloration of this gown, which looks a lot like Mary's. Mary's doesn't show the undervest, and the front of hers has a slimfitting closure, it doesn't overlap robe style like the one in the fashion plate. So despite the similarities, is it really this style of levantine? There are tons of turque variations - some with waist seams and fitted backs, some not. Witness this one with a tight-fitted back from 1787. I have done a sort of turque as other people have, as a roundgown with a sort of polonaise/zone front cut gown over it. But I don't think Mary Russell's looks like it's two gowns, so what to do? 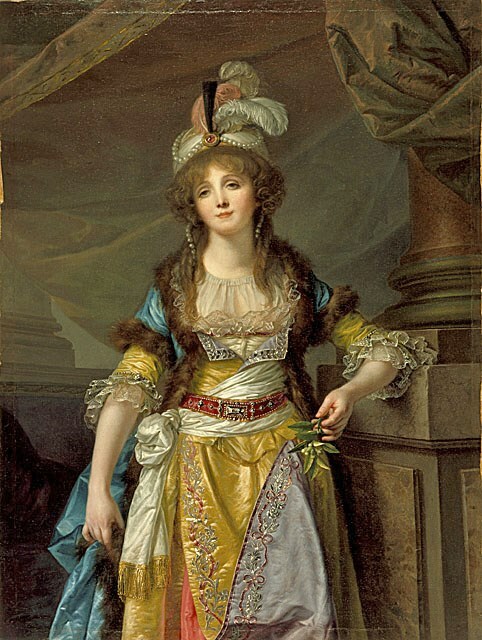 Mary's looks like an all-in-one combo of the yellow silk gown with top front folded down, AND the blue overrobe trimmed with fur, shown in this portrait of Mademoiselle Guimard by Jean-Baptiste Greuze! I had another personally busy year so I focused mostly on small projects, accessorizing things I already had, wearing things I hadn’t yet worn, repairing things I wore once (ie, taking them in), and trying to finish things I started last year. I was largely successful at that. I wasn’t successful at much else. 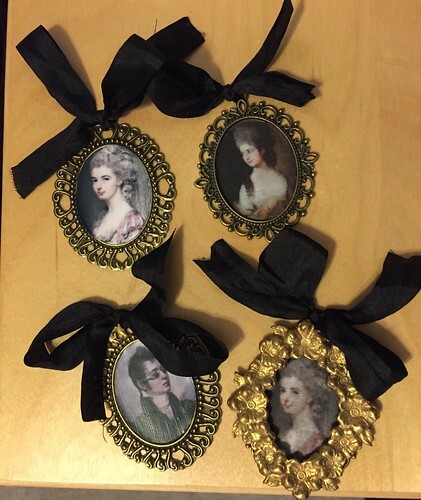 - I made some locket/pins out of findings and silk I had printed on a fat quarter from Spoonflower. 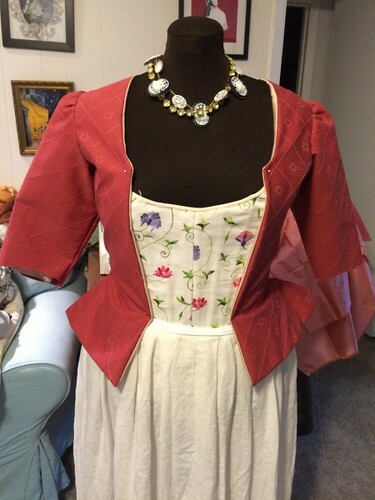 - I repaired my Titanic Jump dress - the beading is so heavy, it stretch out the netting. I had had it on display for a while before storing flat. It was unwearable as is. I managed to pull the netting on the skirt and ruffle up from the top and it should be wearable now. I did finish the sleeves of all three jackets I did last year. 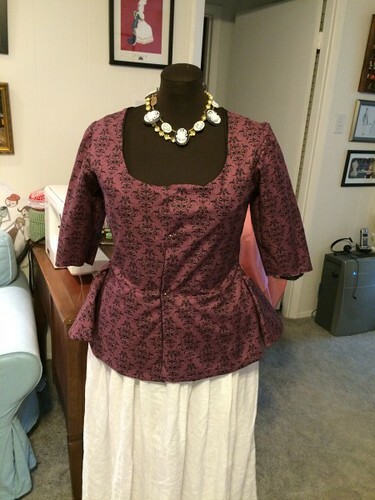 I started on a regency jacket for my husband but got side-tracked/intimidated. 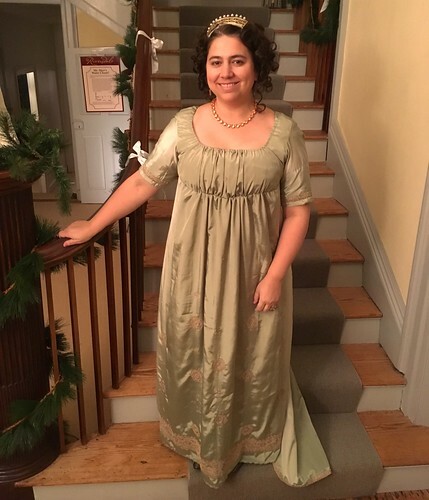 I made a green satin sari regency gown, but I wore it in 2017. Sneak peek! 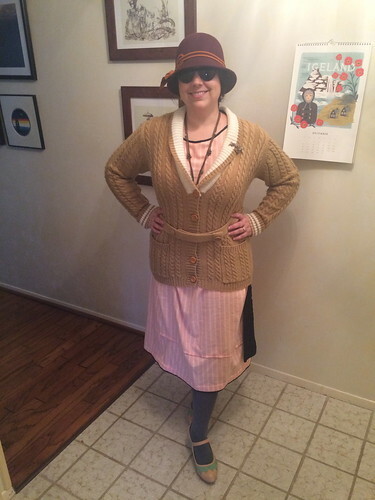 I put together a 20s outfit for a holiday tea because it would be easy to drive and walk in. The hat I got on Etsy (https://www.etsy.com/people/Hatandscarf), the dress I made a year or more ago, the sweater was Etsy with the belt modified, the shoes are Miss L Fire bought on sale from Modcloth and I love them. The necklace and pin are Sweet Romance. The watch was my great grandmother’s. The sunglasses were a 20s style from Forever 21. 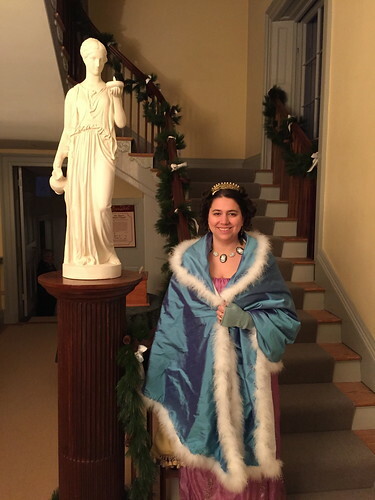 I finally wore my 18th century mantle, made last year. With mitts knit by Gloria (https://www.etsy.com/shop/inthelongrun). 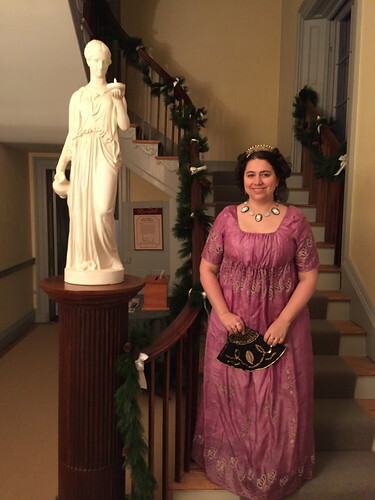 I rewore my purple elephant sari gown, only worn once, with a replica tiara made by Megan (https://www.etsy.com/shop/TheMillineress), and a fan and necklace made by Gloria (https://www.etsy.com/shop/inthelongrun). I didn’t wear a Francaise for the Francaise dinner. Believe it or not, I have gotten a ton of wear out of my francaise gowns. 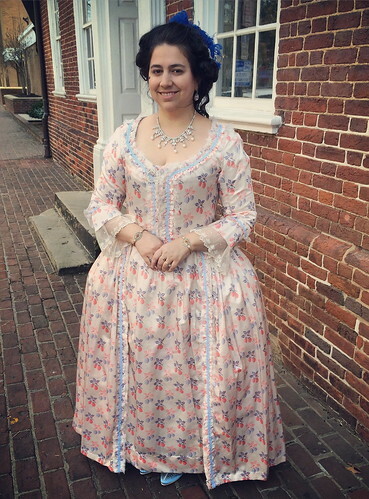 I wanted to wear something I hadn’t worn much - and that was this replica gown from the Marie Antoinette movie. I only wore it once for a small time at Dress U. The bracelets were Downton Abbey Colllection, necklace ebay from China, rings are antique, shoes are American Duchess, and hair pin was a gift. Something else new! 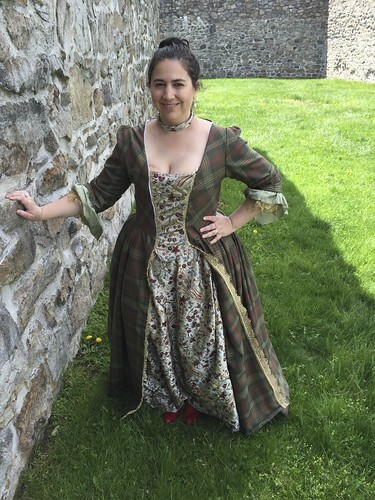 My version of Claire’s gown from The Gathering episode of Outlander. 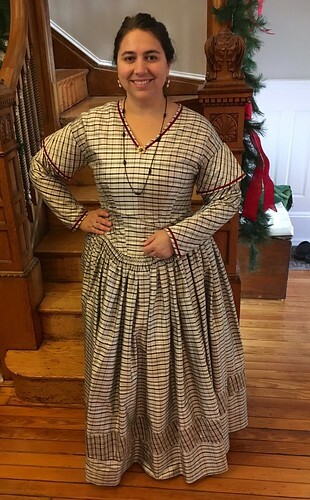 The stomacher and petticoat fabric is screen accurate, the plaid very close. Shoes are American Duchess. I made this last year but didn’t get a chance to wear it much. 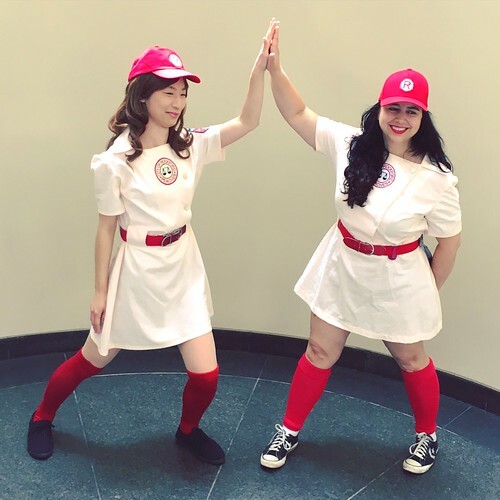 I wore it twice this year, at AwesomeCon with Gloria, and at Disney for Mickey’s Not So Scary Halloween Party! I needed something to wear for a summer (i.e. 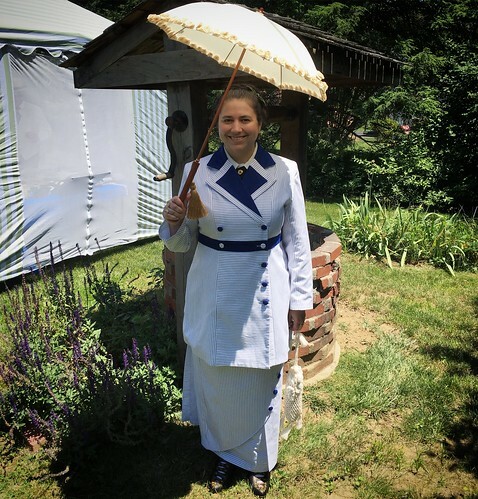 hot) Victorian/Edwardian seaside themed picnic. I didn’t have much time to sew. I ended up being able to throw together a Titanic Boarding outfit! The suit was bought ages ago from Fan + Friend and never worn. I added a dickey (too hot for a full shirt), used my husband’s dinosaur tie, and finally utilized some Titanic accurate accessories I’d be hoarding for a while (earrings, tie pin, purse). I didn’t have the giant hat, so I used a Titanic comb, American Duchess shoes, and later replaced my make-shift dickey with a much more accurate one, plus a more accurate tie. 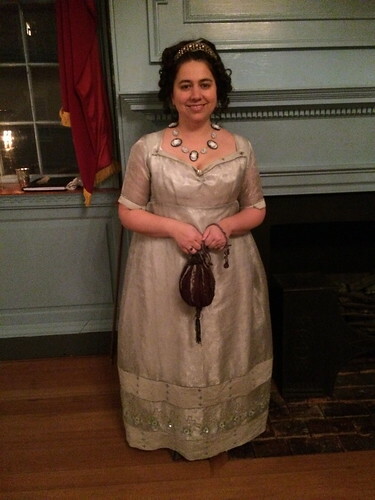 Here’s the one picture from Jane Austen ball where I wasn’t sweaty. It was possibly the hottest day of the year! I wore this sari gown, which I’d only before worn with an over dress. Wheat tiara was ebay, earrings antique, necklace Dames a la Mode (https://www.etsy.com/shop/damesalamode), rings antique, shoes Robert Land. 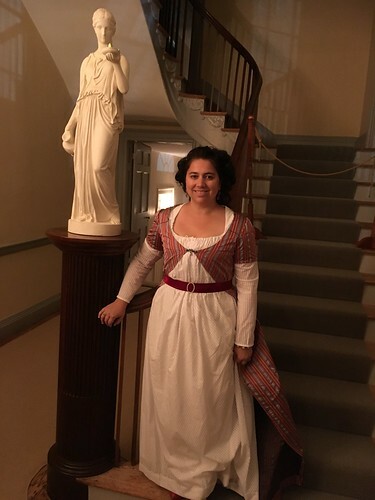 For a fancy dress ball nearish Halloween, I chose this 1790s gown since it was inspired by a fashion plate. I have worn it a few times before, and I do like it! I need to make more overgowns for it. Bracelet and rings antique, shoes American Duchess, buckle and pin vintage. Earrings antique. I wore this jacket (made out of exactly 1 meter of silk acquired in Germany) only once. I had to take it in to wear it again. I really love it. It has a fluffy little peplum. 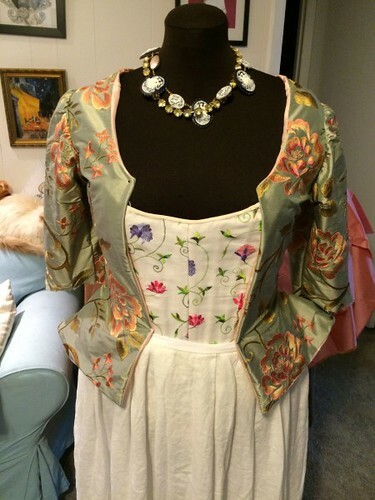 I combined it with a petticoat from one of my francaise gowns. I meant to wear a different white silk petticoat and grabbed the wrong one. That’s ok, I like how this looks. I added a Dames a la Mode necklace (https://www.etsy.com/shop/damesalamode), antique earrings and bracelet and rings, a sash I’ve used before, a pin of my girl Mary Russell made for me as a gift by Gen (http://costumersguide.blogspot.com/search/label/mary%20russell), and American Duchess shoes. 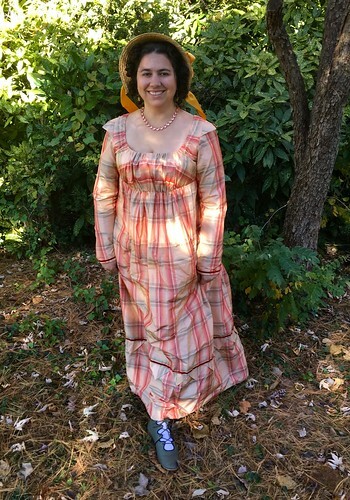 I wore this to last year’s Pumpkin tea but didn’t like my hair, so I thought I’d rewear and get more pics. I forgot a fichu, d’oh. 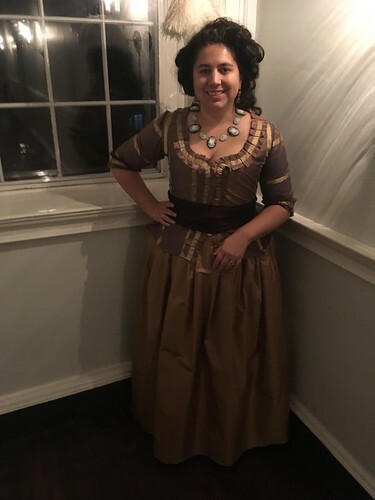 I accessorized it this year with a bonnet made by Amanda (https://www.etsy.com/shop/ClothFair), a different Dames a la Mode necklace (https://www.etsy.com/shop/damesalamode), antique rings and bracelet, and my gorgeous gorgeous expensive American Duchess Exclusive boots. Worth every penny, I adore them. Also I made sure to scotch guard them and they looked fine even after gently wearing them outside. Same day as the Pumpkin tea, my friend’s Halloween party. 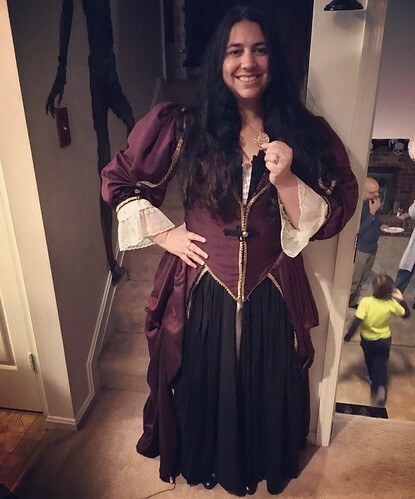 I didn’t have anything new to wear so I decided I was throwing back to like 2006 and wearing my Pirates of the Caribbean costume since I hadn’t worn it in forever, and it was comfortable and didn’t require a corset. I got the chance to wear the other jacket I made from exactly 1 meter of silk bought in Germany. 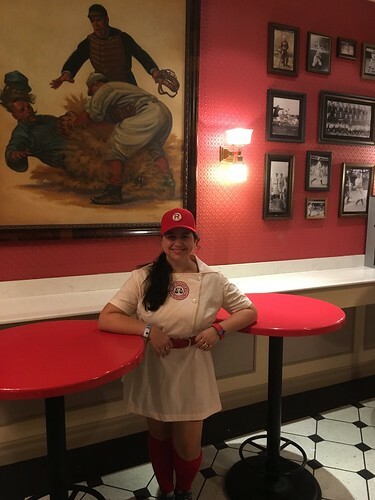 I threw this outfit together for a Gadsby’s ball. I made a petticoat of gold silk from the stash. I wore the jacket which just needed some front fastenings (I hate using straight pins, sorry! ), and a sash from the stash (pure dead dino). With antique earrings and my necklace from Gloria (https://www.etsy.com/shop/inthelongrun). 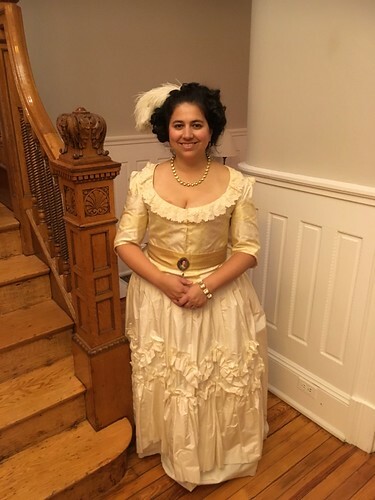 For this Victorian Christmas tea, I rewore the 1840s gown I wore only briefly a long time ago. I had to take it in also. I’m happy with how it looks though. 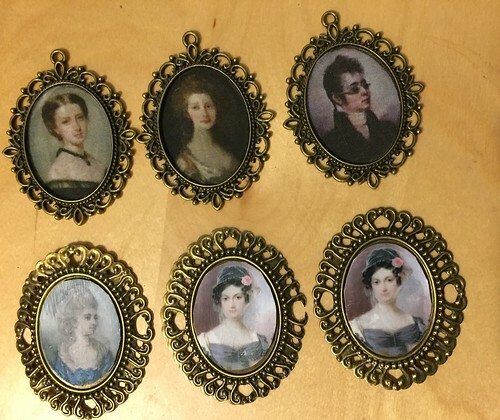 I wore Dames a la Mode earrings (https://www.etsy.com/shop/damesalamode), an antique necklace and brooch and bracelet and rings. 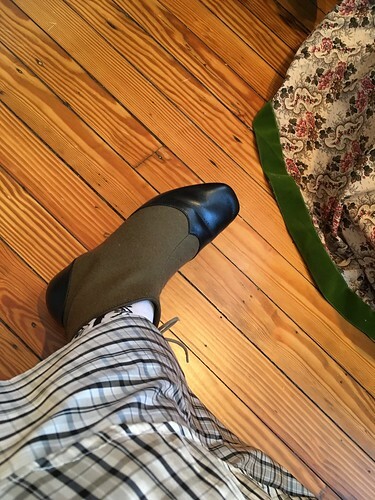 Shoes were my first outing with 1840s side lace booties I bought from American Duchess specifically so I could wear them with my 1840s gowns - and then I haven’t worn them in a while. I was really happy to finally wear them with this outfit, and they were really comfy. sadly not in 2016, BUT I have 3/4 of a new one done right now in Jan 2017! 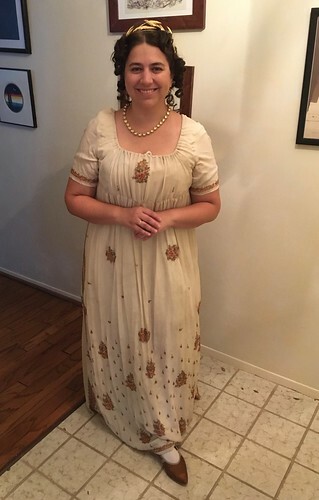 A regency gown out of the cotton silk I bought at Fort Fred.